As I hinted last week, I would have some "interesting" news to tell after my visit to Digium's brand new headquarters along with colleagues Greg Galitzine and Dave Rodriguez. Before I get into the MAJOR news being made by Digium, let me cover what else I learned on my trip. It had been 3 years since I last visited Digium down in Huntville, Alabama. After getting a grand tour of the new Digium building we sat down in a state-of-art boardroom complete with a high-end Polycom IP conferencing unit, theater lighting, and a projector with motorized retractable screen. The boardroom was named the Mark C. Smith Boardroom to honor Mark Smith, who was the founder and chief executive officer of ADTRAN and Mark Spencer's mentor. A picture honoring Mark Smith sits on a table in the room. We all admire how Mark Spencer was able to transform open source telephony - myself included - but no doubt Mark Smith and his company ADTRAN played a major role in making Asterisk the phenomenon it is today. During our full-day meeting, Digium wanted to fill us in on the latest happenings going on and the future directions Digium was planning to take. One of the first takeaways I took was that their 1.5 year term CEO, Danny Windham believes strongly that Asterisk should be classified as an "engine". It's the "core guts" on which other software from third-parties can be added. For instance, Asterisk is not simply an IP-PBX, as of 1.6 it has an SS7 stack enabling Asterisk to be used in carrier and service provider applications. Another example they gave was how Asterisk can run just about any protocol, and were quick to point out that sipXecs, an open source alternative recently acquired by Nortel, can't even natively run Nortel's own digital phones while Asterisk works just fine with Nortel phones. Another important takeaway was that Digium said flat out that claims Asterisk could not scale were false or at the very least were misleading since they were based on older versions of Asterisk. In fact, it seemed Digium took great personal umbrage that some of their competitors were making these claims. As evidence of scalability, they mentioned a particular service provider running thousands of ports and are currently writing a write paper case study on this customer. When they publish it, I'll be sure to include excerpts in my blog. One last takeaway that is important to mention is that Digium considers themselves to be the "Benevolent Asterisk Project Sponsor and Maintainer". This is a key mantra that they want to reinforce. They have no plans to ever fork Asterisk into say an open source version and a premium closed source version. They know there are many companies that do add proprietary code on top of the Asterisk engine and don't give back to the community, but Digium has no plans on monetizing Asterisk that way. I should point out that corporations that purchase Asterisk Business Edition (ABE) do have the right under the dual licensing to add their own code without giving it back to the community, however, there are companies that have taken the Asterisk engine, didn't pay for ABE, added their own code, and didn't give the code to the community. Some interesting statistics about Digium that they told me during the meeting that I thought I'd share. 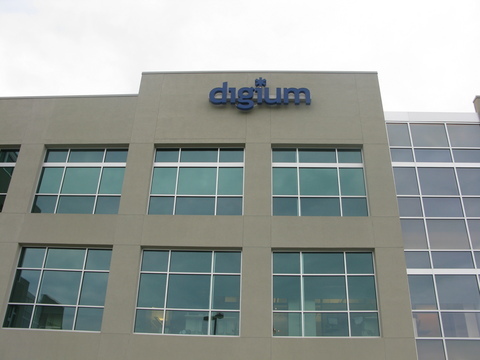 First, Digium currently has 150 employees and has had 26 consecutive growth quarters. The headquarters are now running on Switchvox, which Digium acquired in September of last year. This is the first year that Digium has been named to Gartner's renowned visionaries quadrant. One stat that I've always wonder about is what percentage of Asterisk code is developed by the open source community and what percentage by Digium. Well, the answer is 50% each, which was a little surprising. I would have expected the open source community to be higher, but this goes to show you how important Digium is to the future of Asterisk. They are obviously paying for developers and making an investment in improving Asterisk. Further, the number of commits to Asterisk Trunk was 3,498 (mainly Asterisk 1.6 related) and the number of commits to Asterisk 1.4 was 1,401 (bug fixes). A staggering 132GB of bandwidth was consumed in 2008 YTD. Here's an interesting photo I took from the 2nd or 3rd floor aimed at the Asterisk logo which I believe is the center of the 3 buildings. From what I'm told if you fly over Digium's building, the three buildings form the Asterisk logo. For some reason looking down at this circular area reminded me of the Star Trek Enterprise's warp core. Forget "Powered by Intel", this building is "Powered by Asterisk". Digium recently hired Stephen Burcham, the Director of Quality who came from a company that designed controllers for anti-lock braking systems, which demand the most stringent quality control and reliability standards. Stephen has brought that same high standards mentality to Digium. Surprisingly, Digium's hardware production is done by two American companies, so it's Made in the U.S.A. Considering many electronics can be done more cheaply in China, I was happy to hear Digium was using American companies to manufacture their goods. In fact, Digium is using two local Alabama companies and they told me that they actually made in an investment in at least one of them to purchase a higher-end process manufacturing machine to meet Digium's stringent quality requirements. One of the biggest challenges facing Digium has less to do with technology and more to do with market perception. Digium told us that they have to battle Cisco and their claims that Asterisk is not a business class solution. I found it fascinating that Cisco is still able to leverage their own name brand recognition to get (scare?) customer wins, but if anything that's great news for Digium and Asterisk. It isn't technical comparisons or feature-sets that Asterisk is losing customers to Cisco, it's name brand recognition. That'll improve with time and my guess is very quickly since Asterisk has a full head of steam. Now for the interesting news. AsteriskNOW which previously ran on rPath will now be using the very popular CentOS (5.2) distribution. Now that it runs on CentOS it will support easy operating system updates (via .rpm files). Also new in AsteriskNOW will be a yum repository for easy updates of Asterisk itself. Just 'yum' the lastest version of Asterisk and it will upgrade your version of Asterisk without screwing up your customizations. Also new is that the next release of AsteriskNOW (1.5) will bundle the very popular FreePBX front-end GUI. This is big news! FreePBX has become the defacto standard for web-based GUI administration of Asterisk, so now Asterisk fans can download AsteriskNOW, boot of the self-install CD and not only getting a working copy of AsteriskNOW, but FreePBX as well! This isn't to say Digium will stop developing their own GUI. In fact, when I asked that question, they said categorically they will continue to develop and improve their Asterisk GUI 2.0, which is currently installed on Asterisk Business Edition (ABE) and the Digium Asterisk Appliance 50 (AA50), as part of the 1.2 release I recently blogged about. Digium told me they expect the next release of AsteriskNOW to be available by Astricon. As I hinted last week, I would have some \"interesting\" news to tell after my visit to Digium's brand new headquarters along with colleagues Greg Galitzine and Dave Rodriguez. Before I get into the MAJOR news being made by Digium, let me cover what else I learned on my trip. It had been 3 years since I last visited Digium down in Huntville, Alabama. During our full-day meeting, Digium wanted to fill us in on the latest happenings going on and the future directions Digium was planning to take. One of the first takeaways I took was that their 1.5 year term CEO, Danny Windham believes strongly that Asterisk should be classified as an \"engine\". It's the \"core guts\" on which other software from third-parties can be added. For instance, Asterisk is not simply an IP-PBX, as of 1.6 it has an SS7 stack enabling Asterisk to be used in carrier and service provider applications. Another example they gave was how Asterisk can run just about any protocol, and were quick to point out that sipXecs, an open source alternative recently acquired by Nortel, can't even natively run Nortel's own digital phones while Asterisk works just fine with Nortel phones. One last takeaway that is important to mention is that Digium considers themselves to be the \"Benevolent Asterisk Project Sponsor and Maintainer\". This is a key mantra that they want to reinforce. They have no plans to ever fork Asterisk into say an open source version and a premium closed source version. They know there are many companies that do add proprietary code on top of the Asterisk engine and don't give back to the community, but Digium has no plans on monetizing Asterisk that way. I should point out that corporations that purchase Asterisk Business Edition (ABE) do have the right under the dual licensing to add their own code without giving it back to the community, however, there are companies that have taken the Asterisk engine, didn't pay for ABE, added their own code, and didn't give the code to the community. Here's an interesting photo I took from the 2nd or 3rd floor aimed at the Asterisk logo which I believe is the center of the 3 buildings. From what I'm told if you fly over Digium's building, the three buildings form the Asterisk logo. 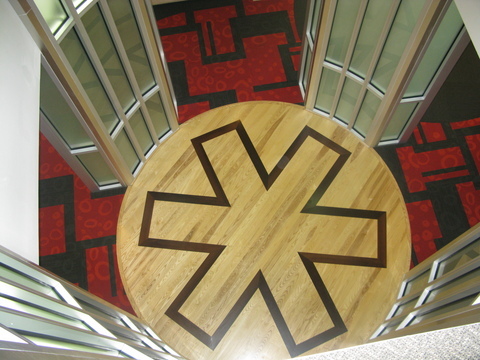 For some reason looking down at this circular area reminded me of the Star Trek Enterprise's warp core. Forget \"Powered by Intel\", this building is \"Powered by Asterisk\".